On December 26, 2017 Chelan Fire and Rescue responded to Wheatland Lane in Union Valley for a residential structure fire. The reporting party was trapped in a back bedroom with his dog and was unable to self-exit the structure due to physical limitations. Chief 701, Rescue 71, Engines 73, 79, Tenders 71, 73, 74 with a total of 16 personnel responded along with two Chelan County Sheriff Deputies, an Ambulance for Lake Chelan EMS and a Chelan PUD unit. The first units arrived in under 12 minutes and reported a working fire with flames visible. The two Chelan County Deputies rescued the occupant through a bedroom window as fire units were arriving and initiated a transitional fire attack, knocking down the outside fire then moving to the interior fire. The fire was brought under control within 24 minutes of arrival of the first fire engine. Damage was limited to a utility room, void space on the second floor behind a stub wall/attic space, the front of the structure and smoke heat and damage in the hallway and kitchen. Crews spent another 30 minutes overhauling the fire area to ensure all hot spots had been extinguished. Engine 79’s crew provided fire watch for the next two hours after fire operations had been completed. “This could have had a very bad out come if the home occupant had not smelled the smoke as he was getting ready to go to bed. The home occupant reported smelling smoke and when he opened his bedroom door the house was filled with smoke and the door felt hot. He closed his door and called 911 telling the dispatchers his location in the house and that he could not get out,” said Chief Lemon. “The fire and rescue operation went very well,” said Chief Lemon. We had a strong response with everyone in the right spot, at the right time, doing the right thing. We had two of our Chelan County Deputies available in the area and able to respond and assist. Our initial response on-duty crew of four personnel were responding within minutes of being dispatched and our volunteer personnel from Satellite Station 73 in Union Valley had a strong response. “We had the best outcome we could have hoped for.” said Chief Lemon. The occupant and his dog were saved and the house can be repaired. 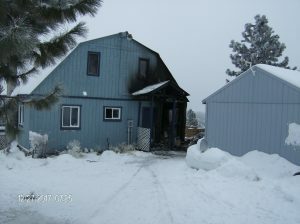 Quick Response by Chelan Fire and Rescue Firefighters stops what could have been a disastrous fire in the Grandview. Chelan Fire and Rescue was dispatched to a report of smoke in a 3rd floor room of the Grandview by the Lake at around 6:47 p.m. The first units were on scene within 5 minutes of the 911 call and two and half minutes of being notified by the dispatch center. The engine connected into the Fire Department Connection (FDC) that supports the stand pipe and fire sprinkler system while other members of the crew accessed the 3rd floor room which they found to be charged with smoke and heat. The crew located a working fire in the void space around the bath tub and reported fire coming from the ceiling area in the unit below them. A second crew was sent in to the 2nd floor unit and found fire in the ceiling area above the bathroom. Both crews were able to knock the fire down and then check for extension. No fire sprinklers were activated due to the fire being in the void spaces and not in the living space of the rooms. The fire was confined to the two units, but a 4th floor unit suffered smoke damage and the 1st floor unit had some water damage. Guests in Building C and D were displaced for about an hour during fire operations. “The fire could have been much worse if we had not had a strong initial response from our on-duty crew followed by aggressive firefighting,” said Fire Chief Lemon. 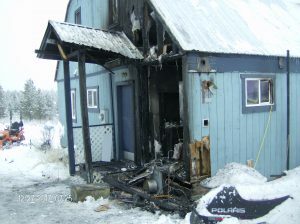 “I credit them with keeping this fire from causing any further damage. During the initial fire operations we were using all available resources that were on the scene to include our EMS folks and the Grandview staff to help ensure the buildings were completely evacuated,” said Fire Chief Lemon. The fire is under investigation.